The Human Computer Network Interface (HCNI) apparatus is able to measure and modify the information fields in the human body. 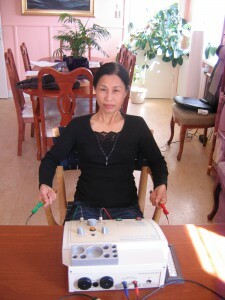 The broadband filter used in the HCNI bioresonance device could be likened to a dialysis machine used to purify blood. A dialysis machine is a mechanical filter system that is able to remove, purify and return blood to a human body. 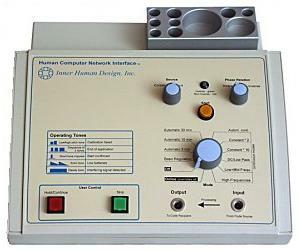 The HCNI device is able to measure disharmonius frequencies in the human body, modify them and return these frequencies into the patient that are conducive to health. Using HCNI a qualified Human Software Engineer (HSE) is able to rectify any incorrect oscillations in the body and return them to their healthy frequency. Incorrect oscillations in the human body are precursors to disease and if they are not remedied symptoms of disease will soon manifest. Therefore HCNI is able to treat diseases while they are still in the developmental stages and have not yet become serious conditions. If a disease has become a serious condition it can still be remedied using HCNI based on the same principle of returning the cells’ oscillations to their healthy frequency. The HCNI is operated through a computer program which also includes dozens of treatments for individual diseases, including allergies.